The AKOYA has made several endurance flights (long flights) this year which has enabled the LISA team to validate the performance using different parameters. These tests have confirmed very low fuel consumption data of 5.6L/100km (42MPG) for a range of 2000 km (1,250 miles). During each flight, the AKOYA is equipped with several cameras for recording how the aircraft performs during pilot maneuvers. Beautiful images over the Bourget Lake in the French Alps were captured during long flights in June. These images offer a realistic immersion in the controls of the aircraft during flight gathered in a short video which we have pleasure in sharing with you today:“Inside the Akoya”. This video highlights the visibility offered from the AKOYA’s broad canopy. 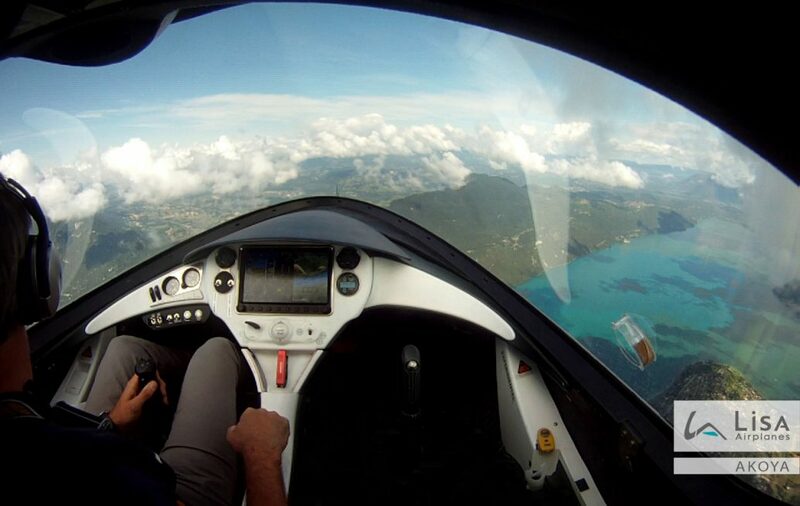 Panoramic vision and in-flight safety guarantees are both sources of great pleasure. The “highwings placed behind the cockpit give an unobstructed view above and below the pilot’s head and vision ahead is unaffected as the engine is at the back of the aircraft. The passengers can now enjoy a stunning view of the surrounding landscape. Once on the ground, ease of use is at an optimum as the canopy is opened and closed electrically.